It’s time to talk about something that annoys a lot of ENT’s–sudden hearing loss, specifically sudden sensorineural hearing loss. This condition is an emergency which needs treatment within 72hrs of onset to have the best chances of restoring hearing and the thing that is concerning to us is very frequently is that patients do not see us for a week or more. 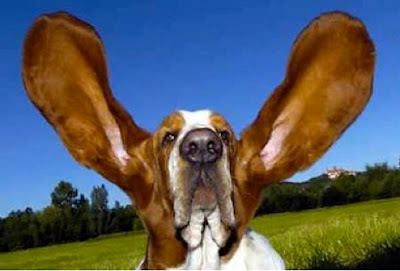 If several weeks go by, often no treatment is effective at restoring natural hearing. First, let’s discuss some pathophysiology so that we are all on the same page.There are 2 kinds of hearing loss. One is conductive (CHL). This means that the sound is not travelling correctly to the cochlea which is essentially the sound processing unit of the ear. Common causes of conductive hearing loss include cerumen (wax) impaction, tympanic membrane perforation (hole in the ear drum), otitis media (infection of the middle ear space with fluid accumulation), and any number of problems with the middle ear ossicles (3 small bones of the middle ear) not moving appropriately. There are other more esoteric causes that will be discussed in another article linked to at a future date. The second type, sensorineural hearing loss (SNHL), occurs when the cochlea or the nerve leading from the cochlea to the brain are damaged by any number of causes such that nerve signals do not reach the processing centers of the brain at a volume conducive to hearing at a normal level. A classic cause of SNHL is presbyacusis or loss of hearing with age. Sudden SNHL (SSNHL) is when that damage occurs quickly–often people notice it first when they wake in the morning frequently at the tail end of a cold. There are two main theories as to the cause of this type of hearing and there is evidence for both. First, and most likely, is viral inflammation. A neurotrophic virus (one that has an affinity to attach to nerves much like the chicken pox virus) is picked up like you would pick up any cold virus. The virus infects the nerve of hearing, cranial nerve VIII (CN VIII), and causes inflammation of it. The problem with this nerve is that it is encased in bone. There is a single blood supply to the nerve within the bone. The nerve becomes inflamed, swells, and compresses and compromises the blood supply to itself causing it to lose essential oxygen and nutrition. It’s not too far different then when you lie on your arm cutting off the blood supply and it falls asleep. The diagram below is my poor man’s attempt to diagram it. If the inflammation is not brought down quickly, the nerve having lacked oxygen and essential nutrients will die. Even if it doesn’t completely die, if the inflammation lasts too long, scarring can occur within the nerve leading to permanent damage. This is why that 72 hour window is so important. If you are assessed and treated within 72 hours, studies show that there is a much better chance of natural hearing returning. 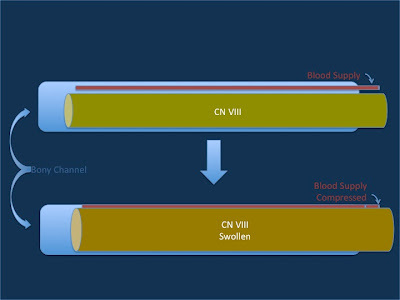 The second theory is that the blood vessel itself is compromised so that there is no blood flow to the nerve, but not from swelling, at least initially. The blood vessel can have a clot form or spread to it (embolus) causing the blockage (much like what occurs with an heart attack or occlusive stroke). Regardless of the suspected cause, the typical treatment is high dose steroid administration either orally or injected into the ear in the clinic to bring down the inflammation in the nerve and restore the blood supply. While SNHL can be differentiated from CHL by doing an exam and using a tuning fork, there really is no substitute for a formal audiogram by a licensed audiologist and a formal otologic (ear) exam by a specialist. If you experience a sudden hearing loss that lasts more than an hour or two, I strongly encourage you to see an ENT and their audiologist in the next 48 hours. The difference can be your hearing. If you would like to have your hearing checked, please do not hesitate to contact us here. Our audiologists have some excellent resources on their webpage.